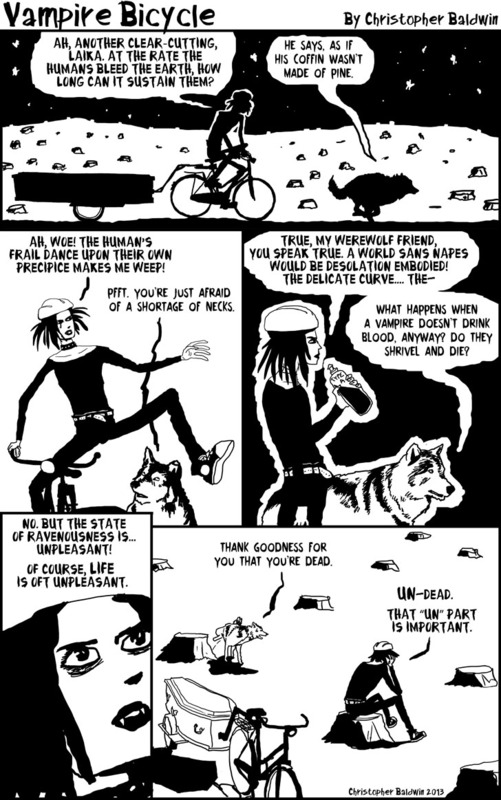 Welcome to my interim comic “Vampire Bicycle.” A non-story gag strip which will run for a few weeks while i finish up development of Anna Galactic. The situation is that of Whitby, a young man (a wee bit over 600 years old), and his werewolf companion, Laika. Whitby rides the globe on his bicycle, pulling a coffin behind him so he has some place to sleep during the day. What’s with the sleeping-coffin schtick? All the vampires do that. Always! Is there some crucial magical detail on a wooden box that makes that wooden box a nice safe coffin? The handles, maybe? The shape (feng un-shui)? Just being pine? Would a stainless steel casket do if it had the right amount of Transylvanian dirt in it? Ha! This is a lot of fun. A vampire wearing a bicycle helmet. Now I have seen everything. Question: ist it a “he”, a “she” or an “it” ? Difficult to say with those size zero goths. Someone once said that when talking about vampires, there’s no rules, you can give yours whatever characteristics you want… this means a whole world of possibilities, and I’m always glad to find good works with these possibilities… Well done Chris! I see you went with the old idea of needing a box, or coffin full of local earth for him. I did like the idea that that was just superstition and that they borrowed into the earth during the day to sleep it off. If they needed to sleep during the day. Now there are loads of different vampires and vampire-witches, vampire-werewolves etc. with different needs. A funny idea great for long term philosophizing like our friendly blood sucker is doing today. Hallowe’en late, but great! Right now we don’t have one or more predators dedicated to keeping our population in check which is why we have so many stories of creatures that do prey exclusively on us. We are the top predator. From the old tales to the movies like Alien and Predator continue that line of thought. The wolfin are failing we are over 7 billion and climbing. One day it will collapse and have a die back. It won’t be peaceful either. I’m really loving the art style here. It’s so different! I had to check three times to make sure that it was your art, it’s that new-looking. Very nice!